You know I’m a sucker for a great cars n coffee event. I’ve traveled all over the country to attend them, and my friend Jeff is on every email blast list possible to notify him of any coming up on the calendar. So we decided to hit this one scheduled for a very fashionable mall in Thousand Oaks, California. 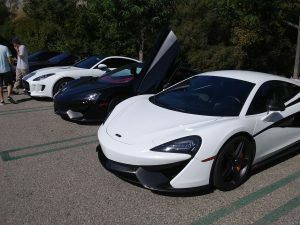 It is hosted by the Matteoli Automotive Group, and Ferrari Westlake (what could be bad?). 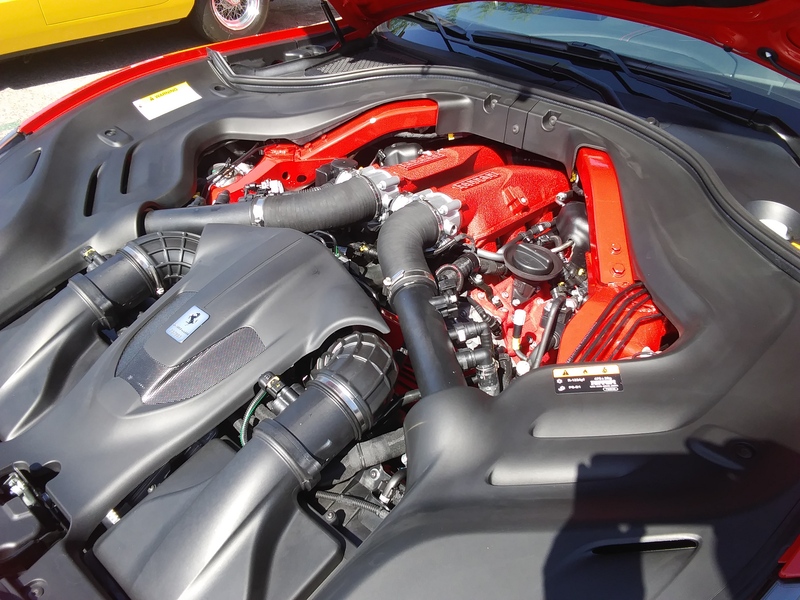 I’ve known Giacomo Matteoli for some years; he’s a Ferrari and Maserati dealer of considerable note, owning four dealerships, plus a special Collezione collector car sales and brokerage division, and a race and championship winning WeatherTech series Ferrari sports car racing team. Yes, a car dealer interested in selling cars, but moreover a nice man, and a deep enthusiast. 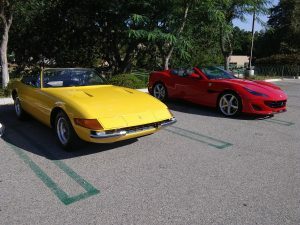 Just to add fuel to the fire, the hosts promised to bring a Fly Yellow Ferrari 365 GTS/4 Daytona Spyder to the event, to display along with a new Ferrri Portofino roadster. OK, you had me at Daytona, so I’m in. 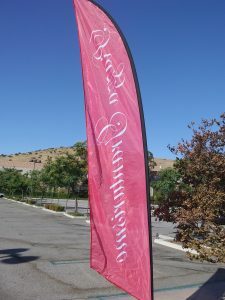 The Matteoli Automotive Group played perfect host, setting the parking lot up nicely with flags and a well stocked coffee truck. There were several staffers on hand to meet and greet and thank and answer questions about the cars, and beyond that it was a healthy group of generally “fast and dangerous” exotic and sports cars. Plenty of Ferraris on hand, as you’d expect, plus a handful of big banger Porsches, and more than a few McLarens. So if you love that kind of hardware, you shoulda been there. The Portofino’s 500 plus horsepower twin turbo V-8 sounds and looks the business. This kinda tells the whole story. 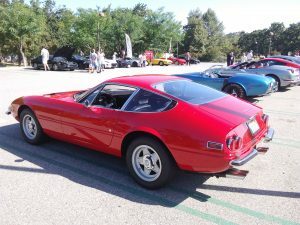 Daytona coupe, Cobra, Ferrari California, then Porsche row, and lots more stuff behind. Compliments and thanks to Matteoli Automotive Group for hosing, and I’ll return for sure.